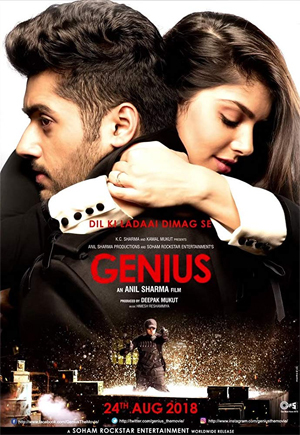 Genius, with the sub-title Dil Ki Ladai Dimaag Se, meaning the battle between the heart and brain, has plenty of brawn thrown into the mind-heart mix. It is a very ambitious film which quotes everyone and everything , from the Bhagavata Gita to Aristole, pronounced Aris-total by Nawaz who plays an elusive slippery ISI title. And when he leaves a message behind after a murder he reads it out as ‘Let’s Ketchup’. There is a subverted pun in Nawaz being described as “slippery” as he keeps talking about being thrashed with shoes and slippers. A hark-back to a youthful trauma that he recreates in a brilliantly acted hospital scene where he describes patricide with chilling casualness. For the rest of the film, though, Nawaz hams shamelessly. Perhaps he thinks acting in commercial cinema is about nothing more or less, than exaggerated reactions. He had earlier done the same in Kick. In Genius, Nawaz’s character of a global terrorist who thinks he plays the film’s title role—little does he know—tells the film’s young hero to disrespect the Indian flag or his women colleagues would be disrespected. Like I said, little does he know. This is a film that wears its patriotic heart on its sleeve. It is an unabashed celebration of saffron nationalism with a major part of the espionage thriller shot in the holy city of Mathura. Director Anil Sharma has always been comfortable shooting mob sequences. For his son’s debut film he pulls out all stops and lets the colours and stunts flow in a gush of glitter and flamboyance. For all its homage to nationalistic heroism and commitment to corny camaraderie, Genius often leans too far back to salute its own masala entertainment. “Not classy,” sneers the film’s debutante heroine Isshita Chauhan. “Not at all. It’s all massy,” snaps back Vasudev the films’s young sanskari hero , thereby acknowledging the plot’s debut to the action thrillers of the 1980-90s, some of them like Hukumat and Elan-e-Jung directed by Anil Sharma. wherein the hero’s patriotic pride was converted into a kitchy ketchupy mayhem. For all its absurd twists and turns Genius has a certain audacity of vision and execution about it. A major part of the film’s charm lies in the film’s leading man’s confident debut. Utkarsh Sharma has an endearing honesty to his personality. Though his character is unnecessarily complicated and cluttered with burdensome details, Utkarsh dodges the sleeping dogs and swishes past the winning goalpost. A star is born indeed. Najeeb Khan’s cinematography breathes an inhabitable life into the over-saturated frames. The more finicky viewers may find the plot and performances to be over-the-top. But then Anil Sharma has never been shy of parading a fulsome machismo in his cinema. Genius is not for the delicately inclined. It has a sledgehammer approach to global terrorism. And it is not shy of going over-the-top. Extreme situations demand an extreme treatment.